Steven Spielberg has done World War II movies a lot but War Horse is his first World War I movie. It is peculiar in a lot of ways. For one, it is a war movie rated PG-13 (and distributed by Disney). Not that it is not occasionally brutal. 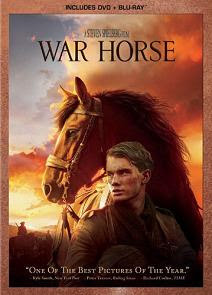 War Horse also has a rather unusual protagonist: this World War I tale is told through the eyes of the horse Joey. It is a somewhat convoluted story centered on his wartime woes. Human characters come and go; Joey changes English, German and French masters. Interestingly, Joey's feats are mostly simple and the focus is on survival rather than heroics. This is also a traditional movie in a lot of ways. It is romanticized and sentimental. This sentimentality often shows in Spielberg movies but here it is taking center stage. In a traditional fashion, Germans and French speak English amongst themselves with the corresponding stereotypical accents. The music score of veteran composer John Williams is traditional to the point of coming through as generic. Cinematography is also old school in manipulating reality, no matter if its Devon's meadows, French forests or the mud of the Somme. In this thirteenth collaboration between Spielberg and cinematographer Janusz Kaminski both England's warm rural landscapes and the foggy war views are beautifully rendered. The latter are almost too beautiful. Spielberg has always been a master of storytelling with the camera. And War Horse doesn't disappoint here. It is invariably technically impressive. Cinema buffs will delight in the numerous clever shots throughout the movie. One can argue that cinematography is the film's best merit. This, or the amazing lack of CGI in the numerous horse stunts involving Joey (five horses played him; each one specialized in specific skills). War Horse is also occasionally whimsical. Which is not surprising when your main protagonist is a horse. It is hard to rein a story like that. (See what I did there.) But in fact, these whimsical moments are amongst the movie's best. In particular, Joey's wild gallop through the trenches at the Somme and a consequent surreal scene in No man's land. On the other hand, the final scene may be a bit too blunt with its color choice. War Horse wastes no time in establishing human characters other than the boy who raised Joey and his family. This helps to keep the pace going. But also effectively turns everyone else into passing figures. Which is both good and bad. Good, because it reinforces the feeling of passing through war and leaving people behind. Bad, because the audience has little time to relate with Joey's masters which strengthens the sense of a somewhat messy narrative. It is easy to recommend War Horse for its visuals and technical competence. But some viewers may find it overly sentimental, while others may find the story of a horse and a boy getting separated lacking. I certainly would not think it worthy of a Best Picture Oscar nomination but apparently the Academy thought otherwise. Nice review. You make a good point about a weakness in the structure of having the humans come and go from the story. I also agree that some might find it too sentimental, but overall it is a good movie and I was not surprised that it ended up being nominated this year, considering the number of nominations.